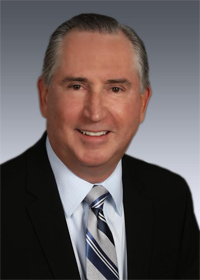 Frank has been a member of the Palm Beaches' business community since 1980. A partner at RSM US LLP, Frank has more than 30 years of experience providing accounting, tax and other financial services to the community. RSM US LLP is the leading provider of audit, tax and consulting services focused on the middle market, with more than 8,000 people in 80 offices nationwide. It is the U.S. member of RSM International, a global network of independent audit, tax and consulting firms with more than 37,000 people in over 110 countries. As a member of RSM, Frank works with a variety of industries, including hospitality, real estate, manufacturing and distribution, and many of the community's nonprofit organizations. After holding a number of other leadership positions across the firm, Frank is currently the Office Managing Partner for RSM's West Palm Beach, Fort Lauderdale, and Naples offices. Frank is very active in the community and is a graduate of Leadership Palm Beach County. Today he is treasurer of the United Way of Palm Beach County and is a member of the Education Foundation. Among his activities, Frank has served as the Chair of the Board of Directors of the Business Development Board of Palm Beach County, Chair of the Economic Council of Palm Beach County, and Chairman of the North Palm County Chamber of Commerce, all of which he continues to support today. For his contributions to the Palm Beaches community, Frank was selected 2009's Community Leader of the Year by the Northern Palm Beach County Chamber of Commerce and received the Excalibur award from the Sun-Sentinel in 2010. Originally from New York City, Frank graduated from Fordham University and received an MBA from Pace University. He resides in Palm Beach Gardens with his wife, Marguerite. Together they are the proud parents of Jonelle and Stephen and grandparents to Keira and Jaxson. Jonelle and her husband recently chose to be married on Frank and Marguerite's 40th anniversary and incorporated a renewal of their vows into the ceremony.